Importantly, all of the above are made from high quality source material and given the polish necessary to not stand out amidst the vanilla Empire interface. 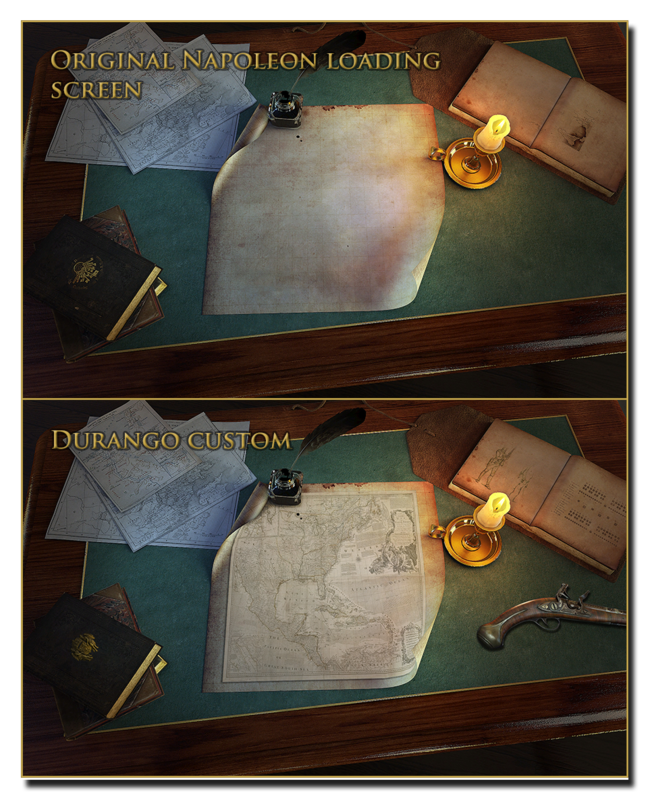 - Custom loading screens based on Napoleon Total War. These have been changed to include items appropriate to the time frame of ETW, such as a central map, sketches, pistol etc. If you play NTW a lot, the changes might be obvious! - Static map background for the main menu. Instead of a continuously playing movie on a loop, this background is based on what you often see in other games. The theme also fits in, with a compass, ropes, and a worn maritime map. - Battle HUD. This new interface replaces the one used for both the campaign and battle mode, so that the campaign now gives you the feeling of managing things at the government level, while going into battle changes things to get a bit more gritty. The new HUD is based on wood and paper, and gives a nice clarity to unit selection. These files should work with most mods that don't change the loading screens, menu interface or UI. It's meant for vanilla and light gameplay mods, but using it in big overhauls might have unintended effects. I have tested them mainly on my own vanilla install as well as my main modded ETW install. All files may be used freely by other modders if they desire to. All I ask is to be given credit. If the download links in this post stop working, any user on the forum may re-upload the unchanged files in this thread. Installation: This is a "movie" type file, so just drop it into your Empire Total War\data folder. 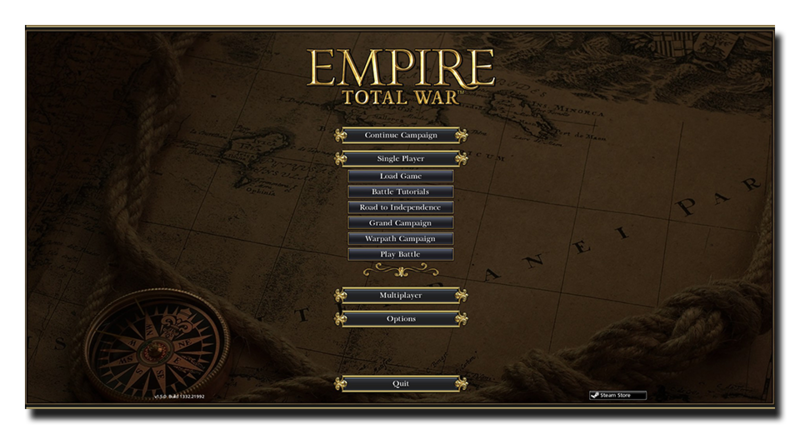 Installation: This is a "mod" type file, you need to place it into your Empire Total War\data folder and then put it into your user.empire_script.txt like you would activate any other mod. 1. Go to your Empire/data folder and make a backup of movies.pack. Keep this file in a safe place in case you need it later. 2. Download the latest Pack File Manager if you don't have it already. Get it HERE. 3. Using the Pack File Manager, choose "Open CA Pack". Choose to open movies.pack, the original one you made a backup of before. 4. Click on the little plus (+) sign next to movies.pack in the left panel. Expand all folders contained therein, until you see a large list of .bik files. 5. Go to the top bar before doing anything, and click on "Options". Uncheck "CA Packs Are Read Only", and choose "Yes" when asked if you are sure. This will allow you to save any changes to the main file. 6. Now, scroll down the large list of files you see, until you find the file frontend.bik. Click on it and keep it highlighted. 7. Next, go to the top bar and click on "Options", choosing "Replace File". Navigate to the place you saved my custom frontend.bik and click on it, and choose "Open". The file we just replaced is now highlighted in red. 8. Save the pack file. Done! I highly recommend Bran Mac Born's Napoleon Effects Pack for getting the complete Napoleon effects on the campaign and battle map. It includes filters, lighting, battle maps, campaign textures and more. Very worth it for getting old ETW up to spec with the more later games in the series. Feel free to leave feedback below, as well as suggested changes and expansions. What would you like to see? For the future, a bigger overhaul of the campaign HUD is something that I've thought about, if there's demand for it. Great work! I like what you have done. If you need any help with editing the UI (especially finding one image file) don't hesitate to ask. I've seen your previous work as well, and it is awesome indeed. If the campaign UI ever gets done, I will surely want advice on that. Impressive modding work and a well-presented mod, thanks for making this available! Thank you! If you're looking for graphical work done for a new or updated mod (like your great Minor Factions packs) just let me know. I'm enjoying a nice campaign using the unlocked ships you provided. Congratulations for your awesome work! Indeed this is very impressive!